Charades is an age-old game that is fun for practicing vocabulary. I have been using it since my student teaching days and don't see myself stopping anytime soon. Here are seven reasons why I love charades and several ways I've adapted the game for various topics. It's an extension of what we do every day! Keeping in the target language 90% of the time, we language teachers are accustomed to using lots of gestures, and our students are accustomed to seeing them. It keeps students in the target language. It can be made into a fast-paced, energetic competition. Students are familiar with it, thus it's easy to explain in the target language! In a 90%+ TL world, that's a huge plus. It applies to many topics. It is low or no-prep, and can be pulled out at the end of class when you wrap up early. When done with vocabulary words written on paper, it hits on both reading and speaking. I always start by showing students how I like to act out the terms. This makes the charades process much easier. Sometimes I throw on some dance music and just have students repeat after me the terms and the actions. There's usually a lot of giggling and laughing during this activity, but they don't forget it! Jacques a dit/Simon says is a great alternative to traditional charades. I often turn it into a competition. I give students in groups each an envelope filled with the terms written on strips of paper. Students take turns looking at the terms and acting them out. The first group to empty the envelope wins. ER Verbs - You can use just the infinitives, use a subject and a verb, incorporate negatives, or just use them with J'aime/Je n'aime pas. Irregular verbs - Take a verb like "faire" for example, and use it with expressions that use "faire". Months - I usually act out an event associated with that month (see below). Adjectives - I haven't done this yet, but I am planning to this year. Obviously, some adjectives lend themselves to charades more than others. You could combine this with "être." For instance, a person pointing to him or herself and then laughing would represent "Je suis comique." Le printemps/Spring: I pretend to smell a flower. L'été/Summer: I pretend to be sunning. L'automne/Fall: I pretend to rake leaves. Il neige/It's snowing: I pretend to catch snowflakes on my tongue. Il y a des nuages/It's cloudy: I frown and point upwards. Janvier/January: I pretend to be cold. Février/February: I make a heart shape with my hands. Mars: I pretend to be cold and then hot, signaling the changing weather of March. Avril: I pretend it's raining with my fingers (April showers). Mai: I pretend to smell a flower (as in, April showers bring May flowers). Juin: I walk away from the class waving, as if to say good-bye. Juillet/July: I pretend to wave a flag, in honor of both the French and American national holidays. Août: I pretend to be sunning, since August is a typical vacation month in France. Septembre: I step forward and wave to the class, mimicking the first day of school. Octobre: I make a scary face. Novembre: I pretend to eat for Thanksgiving. Outside of the US, a different charade will need to be used. 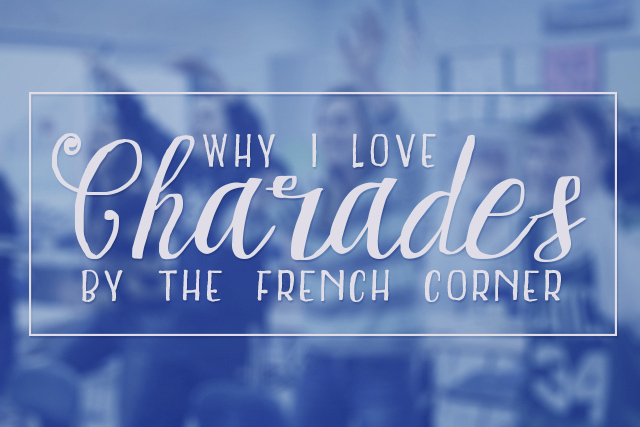 I hate to use something that doesn't exist in the French speaking world for a charade, but students are aware of this. Décembre: I pretend to offer a gift. Je ne comprends pas/I don't understand: I pretend to tear my hair out. Travaillez avec un partenaire: I point to a person and then to myself, as if to invite someone to work with me. Travailler/To work: I pretend to mop or wash a desk OR I pretend to type. Regarder la télé/To watch TV: I gaze off into the distance and pretend to change the channel. So, if you haven't played charades in awhile or if you haven't played them at all, give them a try? What are some ways you adapt and extend charades?